You only need a few steps into the Nyungwe rainforest to feel the allure of Central Africa. Colourful orchids cling to majestic mahoganies and ebonies, butterflies abound, and then the cacophonous hooting of a 700-strong colobus monkey troop permeates the mystique. Untouched and exotic, Nyungwe Forest Reserve evokes the surreal atmosphere of the Congo Basin. Most of Central Africa is inaccessible to visitors, either logistically or because of conflict. Covering the southwest corner of Rwanda, Nyungwe gives you a very authentic flavour of Africa's Congo Basin rainforests, without leaving the comfort and luxury of Rwanda. It's a four-hour drive from capital city Kigali. 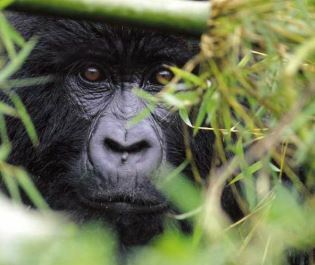 We can connect you with an expert driver-guide, and you break the journey at some of Rwanda's finest cultural attractions, like the National Museum along with some haunting yet unforgettable memorials. Meet incredible primates on foot. The fairytale forest is far too thick for vehicles so you explore on walking safaris. Around a quarter of Africa's primate species occupy these trees and specific tracking experiences bring astonishing moments. Chimpanzees are the most revered sight and they occupy the thickest realms of the park. Grey-cheeked mangabey are a rare and spectacular primate, while nothing can ever prepare you for seeing the giant troops of Rwenzori colobus monkeys for the first time. Seeing 20 or 30 monkeys together is impressive. Seeing several hundred is unfathomable. A forest for adventurous souls. Every trek could encounter 13 different primates but even if you only see a couple, the enigmatic rainforest ambience and surreal setting makes every adventure worthwhile. There are close to a hundred miles of hiking trails; while it's not required, taking a guide massively increases your chances of seeing some of the bashful mangabeys and monkeys. For all its Central African flora and fauna, the experience isn't anything like Conrad's Heart of Darkness. Nyungwe Forest Lodge provides sheer luxury in the heart of the rainforest while Nyungwe Top View Hill Hotel provides the ultimate vista over the canopy. Both are surrounded by playful troops of the endangered L'Hoest's monkey and we've spent many enchanting hours watching the primates swing around our balcony. 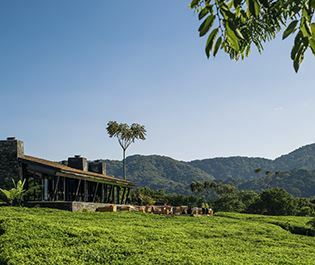 If you wish to be transported into another world, look no further than Nyungwe. It's so captivating you might not want to leave the rainforest canopy. This five-star lodge is all about modern luxury in a traditional setting, with hotel-style facilities and glorious views over Nyungwe Forest and its primates. Meeting a wild gorilla amongst Volcanoes National Park's luscious forests is a thrilling moment we're certain you'll never forget.